Looking for somewhere to watch the big fight whilst eating some delicious food? We’ve got you covered. Here’s three places to watch the Mayweather vs McGregor fight in Dubai whist having a slap-up meal. Burger and Lobster will be running a limited-edition Mayweather vs McGregor menu, whilst screening the fight live from the restaurant. On 27th August, the Downtown eatery will be serving ‘the Mayweathered eggs benedict’. The dish comes with fresh lobster, eggs Benedict, English muffins, grilled tomatoes, mushrooms, baby potatoes and hollandaise sauce. 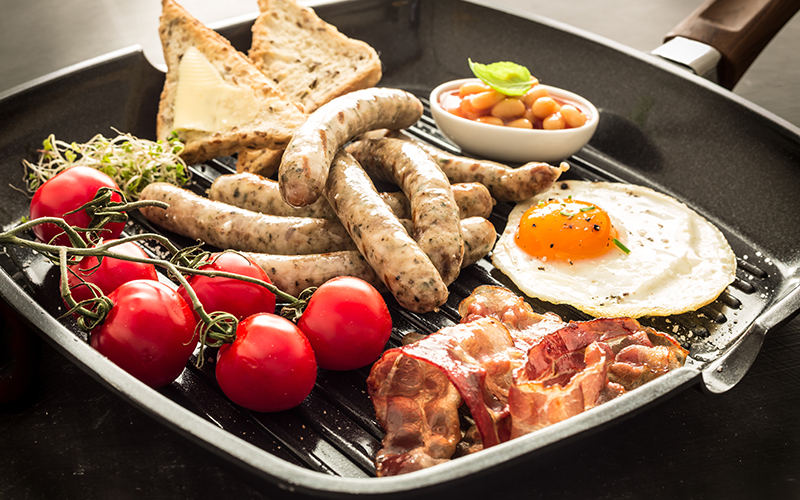 If you’re more of a traditionalist, you might want to try ‘the full McGregor breakfast’. It comes with chicken sausage, veal bacon, mushrooms, tomato, black pudding, baked beans and eggs. Both dishes are served with brioche toast, jam and butter. Details: From 4am on Sunday 27th August. Breakfast set menu is AED 110 per person inclusive of select beverages. For more information visit Burger and Lobster. Head down to Emirates Golf Club’s summer tent to try out their ‘punch brunch’ this 28th August. The club will open at 5.30am, to show the fight, with breakfast served from 6am. There will be full English buffet available, all-inclusive for AED 110 per person. Dishes will include two types of sausages, two types of bacon, grilled tomatoes, hash browns, mushrooms and friend eggs. There will also be cold cuts of meat and cheese on offer, along with a range of teas, coffees and juices. Details: From 5.30am on Sunday 27th August. Breakfast buffet costs AED 110 per person. For more information, visit Emirates Golf Club. If hair of the dog is more your thing, head down to Bridgewater Tavern for the fight. It will be offering a range of drinks and breakfast options, including: croissants, Danish pastries, banana bread, muffins, fresh fruit to a full fry including scrambled eggs, tomatoes, beans, mushrooms, hash browns, maple glazed veal bacon and chicken sausages. There will also be bread and butter pudding with whipped cream, vanilla sauce and berry compote to sweeten the deal. Details: From 7am 27 August. AED 200 per person including unlimited breakfast items. Bar will be serving, but not included in the price of the ticket. For more information visit Bridgewater Tavern.